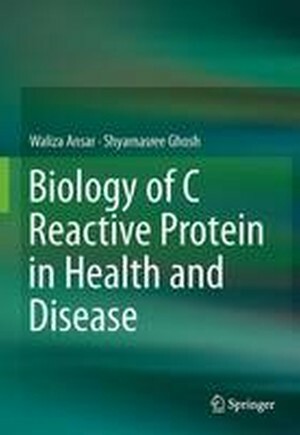 This book offers a comprehensive study of C-reactive protein (CRP) belonging to the pentraxin family, including a brief history of CRP, its structure, synthesis and evolution. Focusing on the emerging role of CRP and its clinical application in the field of disease biology, it details the pathophysiological role of CRP in a host of diseases such as cardiovascular disease, diabetes, cancers, rheumatoid arthritis and infectious diseases and others. It also discusses the role of innate immunity and acute phase response (APR) and their key mediators in the host body in response to tissue injury, infection, trauma or surgery, immunological disorders or neoplastic growth. CRP’s significance in inflammation is highlighted, and its importance as a clinical marker in cardiovascular disease, its functional significance in Leishmania and Plasmodium infections, its association with the development of insulin resistance in type 2 diabetes mellitus, and its role in cancer are discussed in detail. The book also includes clinical data studies and presents the latest research advances to further readers’ understanding of CRP. 1. Immune System: Freedom from the burden of diseases.- 2. CRP: Historical perspective, structure, evolution, synthesis, clinical and biological functions.- 3. Acute-Phase response and Acute Phase Proteins: Application in Human and Veterinary clinical chemistry.- 4. Inflammation, inflammatory diseases, markers and mediators: Role of CRP in some inflammatory diseases.- 5. Micro-heterogeneity of Proteins: Role in diseases.- 6. Pathobiological role of CRP in some diseases: Clinical medical applications of CRP.- 7. Role of CRP in cardiovascular diseases.- 8. Role of CRP in Leishmaniasis.- 9. CRP and diabetes: Sugar is not so sweet.- 10. CRP and Cancer.- 11. Role of CRP in Malaria. Waliza Ansar. PhD is an alumnus of the erstwhile Presidency College, Kolkata. She mastered in Zoology with specialization in Fisheries and Aquaculture from Calcutta University. With interest in the field of immunology, she started her research in 2003 in Indian Institute of Chemical Biology, Kolkata and earned her Ph.D degree working on various biological roles of CRP in Malaria, Leishmania and Tuberculosis. After her post-doctoral research in IICB working on host-parasite interactions, she started her teaching career as a Lecturer of Zoology in Presidency College, Kolkata in 2002. In 2009 she joined Asutosh College, Kolkata as a lecturer of Zoology for postgraduate students. Currently, she is working as an Assistant Professor of Zoology, Behala College, Kolkata, under Calcutta University. Her current research interest involves various clinical role of CRP in diseases, pathophysiology of some acute diseases, nanotechnology and therapeutic applications and stem cell therapy. She has presented her work in international and national symposiums. She has published a number of papers in journals of national and international repute. She also has authored a number of publications and book chapters. Dr. Shyamasree Ghosh is currently working in the capacity of Scientific Officer (E), School of Biological Sciences, National Institute of Science Education and Research (NISER), Bhubaneswar, an autonomous Institute under Department of Atomic Energy, Govt of India currently located in Jatni, Orissa. She graduated from the prestigious Presidency College Kolkata in 1998 in Zoology and was awarded the prestigious National Scholarship from the Govt. of India in the same year. She obtained post graduation in Biotechnology from Calcutta University ranking second in the University in the year 2000. With her immense interest in the field of science, touching human lives, she continued her PhD from Indian Institute of Chemical Biology, CSIR, Kolkata by qualifying for the National Eligibility Test conducted by Ministry of HRD, Govt of India. Her PhD work in the field of Childhood Acute Lymphoblastic Leukemia (ALL) was accepted in various national and international journals of repute and is cited by the young researchers across the globe. She worked in the field of stem cells and nanotechnology in her post-doctoral Research. Later she joined as a faculty in post graduate college affiliated to Bangalore University. She has authored several publications that include book and encyclopedia chapters in reputed journals and books. Research that tries to decode the complexity of disease with hopes for a better living forms her research interest.